Mary Martin of Larkspur Stitchery on Facebook stitched up Lilly’s Golden Circle design in blackwork. She did a fantastic job, and I love the way she adapted the design for blackwork. I thought it would be fun to share her Hungarian blackwork piece with you, in hopes that it might inspire you, too! Mary stitched the piece on 32 count linen, using mostly Dinky Dyes silks. 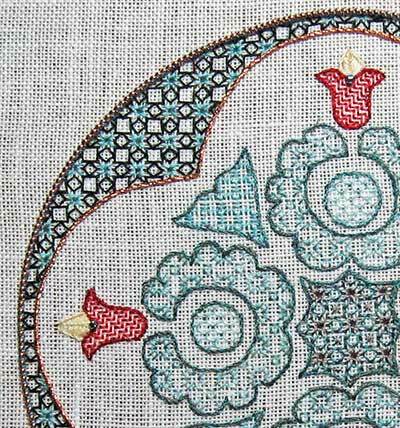 She used a copper passing thread around the inside quatrefoil outline, and copper pearl purl #1 to outline the outer circle of the design. She chose the color scheme according to the predominant colors in her mom’s Arts & Crafts style home, since this was a gift for her mother. Notice the variety of blackwork fillings just in this center area! 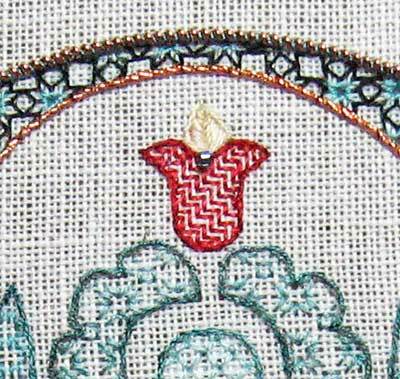 For the small tulip flowers around the four points of the design, Mary used a darning pattern for the filling, and set in the notch on each tulip is a little Mill Hill bead. And the piece, framed beautifully! I think it looks terrific in the frame – I love how the pearl purl outline creates a bit of a shadow around that outside outline! 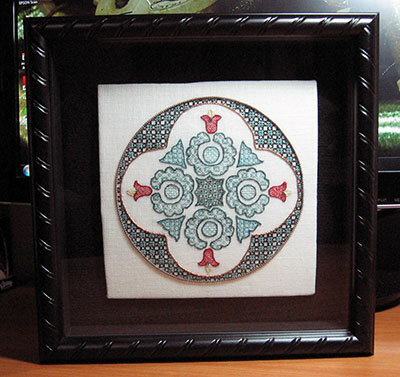 Here’s the blackwork piece next to another familiar design, framed up. 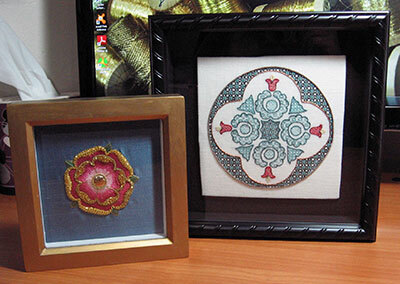 Mary also stitched and framed her own version of my silk and goldwork Tudor-style rose. Lovely! Another example of how you can take an embroidery design and make it unique and truly your own, by interpreting it your way! Thanks, Mary, for the inspiration! 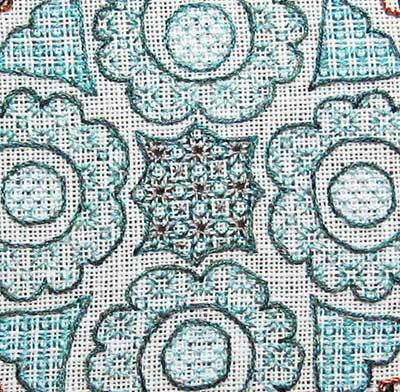 If this inspires you to try something similar, feel free to check out the Hungarian embroidery patterns here on Needle ‘n Thread. I have some more to add to the collection, but “transcribing” the original paintings into patterns takes a bit of time. I hope to get to those throughout the coming months. And speaking of Hungarian embroidery, I have a project update for you next week… yes, some progress on the runner! September 17, 2011 Hungarian Embroidery Pattern #10: Circus Pods? How very exciting! Thank you for sharing it. And how lovely Mary Martin. Inspiring. Thank you both for sharing. Progress on the the runner?! Yay! Can’t wait! Good job, Mrs. Martin, on your project! Enjoy your weekend, too, Mrs. Corbet. And of course everyone else enjoy their weekend, too! Mary Martin, beautiful work! To both Marys, thanks for sharing and have a wonderful weekend! What lovely piece of embroidery and it is beautifully framed you must be so proud Mary Martin well done. I look forward to your update on the Hungarian runner Mary have a great weekend. Wow! The details are so delicate it reminds me of lace. Absolutely gorgeous. Thanks for sharing Mary’s beautiful piece. It looks like a china plate! Yes, inspiration definitely! 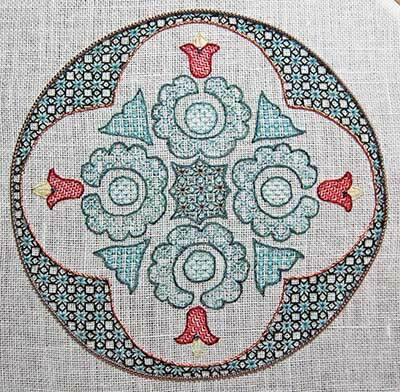 I see using this style of coloured ‘blackwork’ in silk threads as an element in ‘crewelwork’. Very pretty. Lovely work, Mary M. And thank you Mary C for showing it. I am betting Mary M’s mother was pretty happy with her gift.